Peel and halve the cucumber, remove the seeds and cut into strips. Remove the seeds from the pepper and cut into strips. Place the cucumber and pepper in a bowl, cover with cold water, leave to stand for 1 hr. Drain the vegetables and press out all the liquid. Crush the mustard seeds and fennel seeds. Put the mustard seeds, fennel seeds, chilli flakes and all the other ingredients up to and including the vinegar in a pan. Add the vegetables, bring to the boil, reduce the heat and leave to infuse for approx. 10 mins. Transfer the vegetables to preserving jars while still hot, barely cover with the liquid, seal the jars and allow to cool, refrigerate. Fry the burgers in a little clarified butter for approx. 4 mins. on each side. 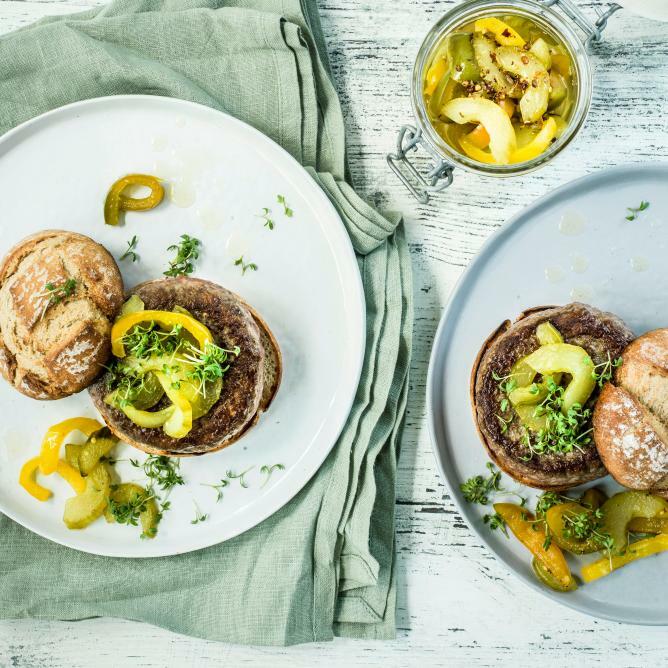 Serve the burgers with the cucumber & pepper relish. Serve the relish with the burger, garnished to taste with cress.